Plans can be categorised to allow easy filtering and searching of different types of plans. All services start with a predefined base set of planning categories but you can edit and add your own categories. For example, you could change the predefined 'Goal' category to 'Aspirations', or you could add a completely new category called 'Parent aspirations'. If you've set up rooms at your service, your service's category set is shared by all rooms (each room doesn't have it's own set). So when a room adds a new category or edits an existing category, these changes are reflected across all groups. 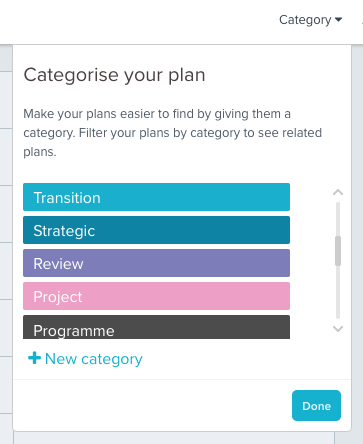 When creating or editing a plan, click the 'Category' link at the top of the page, then select one or more categories that you want to add to the plan. To remove a category from a plan that you are editing, simply select the category, and in the dropdown deselect that category. 1. Open the category menu by clicking '+ New category'. 3. Select a category colour. 4. 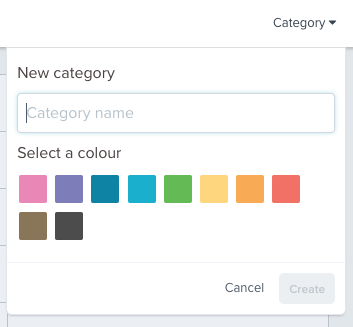 Click the 'Create' button and the new category will be found in your categories list. If you are an admin you can edit existing categories. Open the category menu by clicking 'Category'. In the dropdown Click 'Edit' to the right of the category you want to edit. Edit the name or colour for the category. 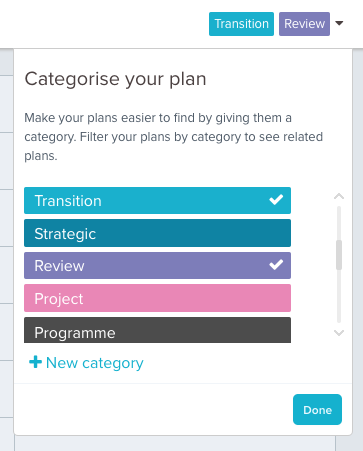 Categorising your plans makes it easier to find and display plans of the same type. Learn more about ordering and filtering plans.